All things— no matter how good the quality, eventually wears out or gets dirty, and may need replacing or cleaning. Preventative maintenance is a very good procedure to do if you want your fiber optic cables to last. And with some careful maintenance, the old saying, “if it isn’t broken, don’t fix it” could apply. In fact, it is one of the things that you’ll learn in a fiber optic training course. However, a properly installed fiber optic cable plant needs no periodic maintenance, however, there are a few factors that harm fiber. Let’s see how to prevent such problems. Perhaps the biggest enemy of fiber is dirt. Dirt can scratch the ends of the connectors during the termination process. These scratches produce high loss in mated pairs of connectors. Dirt can get on the ends of the connectors when they are exposed to the air and cause damage. Connectors can be cleaned with lint-free pads and isopropyl alcohol, however, it would be better if you use solutions available in office supply stores, which are designed to clean computer parts. Fiber optic cable is tough. It can be pulled to hundreds of pounds of tension during installation, as long as it is not bent too tightly, and crushed with large loads. Too much tension or too-tight bends might not break the glass fiber, but it may cause degradation in the fiber. Too much pressure from tension causes the cable to stretch and, when it relaxes, the fiber may be pinched as the cable contracts. This can cause stress losses in the fiber along the length of the cable. Bending the fiber tightly causes light loss, with greater loss at longer wavelengths (1,310nm and 1,550nm). Bends can occur as the fiber is pulled around corners or through bends in conduit. 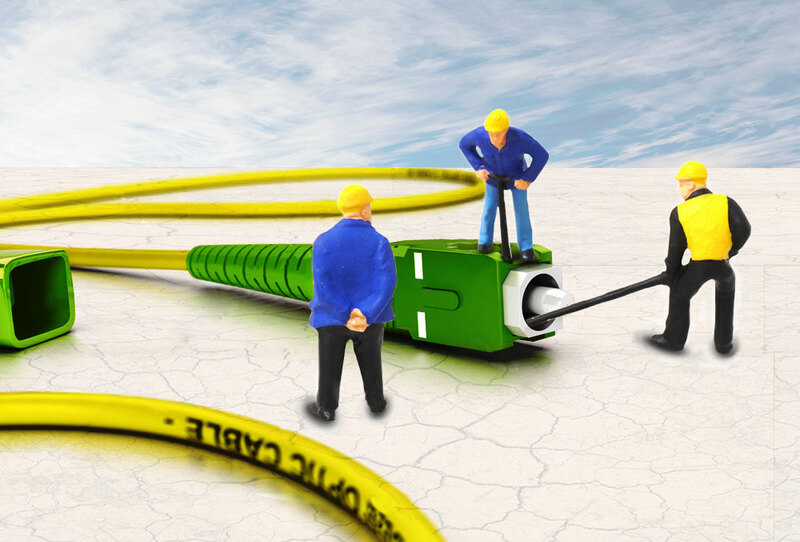 But even well done installation can be damaged by later projects which may put other things, not just cables, on top of the installed fiber optic cables. Even worse, workers removing old cables may kink or cut perfectly good cables by mistake. The connectors on the end of the cable are the most vulnerable part. They cannot withstand the pulling or twisting that a cable can. Bending the smaller cable used with connectors just behind the connector may break the fiber, and it is a very hard failure to find. You invest so much in fiber optic cables, so protecting them makes good sense. Fortunately, doing so may not add much cost to the installation. Here are a few ideas. If you are installing fiber optic cables in an area with lots of other cables already there, install the cables inside an innerduct. Innerducts are large plastic tubing, which usually come in an orange color, designed to ease cable pulling and to protect the fiber. Innerduct is also strong, and hard to kink. After installing the innerduct, pulling the fiber optic cable is easy, as the innerduct maintains a large bend radius for the cable and the inside is a special low-friction surface to minimize pulling tension. To protect your connectors, use only patch panels that are enclosed, and where the doors have locks. If you want to make your fiber optics visible, you can get panels with see-through doors, but still with locks. This protects the connectors from accidental bumps that can break the fiber just behind the connectors where they are most vulnerable. Keep them clean and safe from harm.